A Kitchen Essential For Coffee Enthusiasts and Lovers! Waking Up With The Smell of Fresh Coffee In The Morning! BEMINHe's Coffee Maker is the perfect tool to save your significant time and effort - less work, perfect full flavoured coffee in minutes! 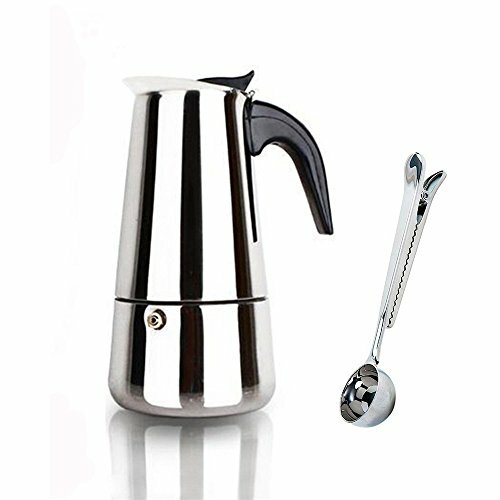 1.BEAUTIFUL, UNIQUE, AND FUNCTIONAL - Elegant Appearance.Classic Italian method of brewing espresso. Practical and produces a full-bodied cup of espresso in under 5 minutes! 2.MAKING GREAT ESPRESSO - For an excellent cup of coffee this Espresso Coffee Maker can be placed on Most cooking appliance and in minutes you'll be enjoying a superb full bodies cup of coffee. 3.SAFETY FOOD GRADE STAINLESS STEEL - BPA FREE,Eco-friendly.Solid, durable and lasts for years. 4.SIMPLE OPERATION - Three compartments fit together easily by screwing,just simply add water,add coffee,apply to the stove and you have coffee in minutes. 5.DISHWASHER FRIENDLY - Easy to clean store and safe to put in the dishwasher. 6.MAKES A PERFECT GIFT FOR ANYONE - Great Mother's and Father's Day gifts.Best birthday gift for your friends who loves coffee. 1.Fill the lower chamber with water, place the filter in, then fill with medium ground coffee.Do not press the coffee down too firmly. 2.Screw the two sections together making sure the filter and rubber gasket are in place, this ensures a perfect seal and it is very important! 3.Place the pot onto your cooking appliance and heat. 4.When the coffee has ceased flowing the percolator should be removed from the heat. Serve. PREMIUM QUALITY--Superior Stainless steel durable construction that is guaranteed to resist stains,odor,rusting,corrosion,tarnishing and deformation. Ergonomic heat-resistant handle which provide comfortable grip for every use. MAKE THE PERFECT ESPRESSO - With the permanent coffee filter, there's no need to deal with messy paper filters. Just simply add water, add coffee, apply to the electric or gas stove and you have rich and tasty coffee in less than 5 minutes. 2 Cup Capacity Perfect for a Boost of Energy.makes it easy for sharing.Enjoy the classic Italian method of brewing espresso! FREE BONUS - stainless steel measuring coffee scoop, helping you get the exact coffee to your own taste, saving your time and money - don't waste any of them. For best results, suggest use fresh roasted, finely ground coffee with a 6-to-1 water to coffee ratio. GREAT GIFT - 4 optional volumes with elegant appearance, impress your guests by bringing class and décor to any environment.Makes the perfect gift for men and women on almost ANY occasion including Christmas, Holiday, Xmas, Wedding, Housewarming, and Engagement and so on. 100% SATISFACTION WARRANTY: We stand behind our products. We know that once you use BEMINH's Espresso Coffee Maker, you'll be amazed at its strength and simplicity. If you're not, just send it back, and we'll gladly refund you the cost or replace it.BUY IT NOW WITH CONFIDENCE!